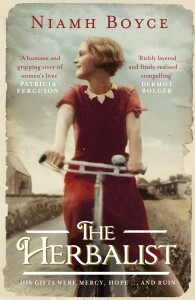 Late in the last week I started reading The Herbalist. I noted this book to my to read list (actually this is my non-existent mental list. I just fav some tweets or add anything interesting to read button on my computer unfortunately not to return soon) when I read Niamh Boyce’s interview on Booksbywomen website. Something got me. She was telling about how she wrote the book inspired by a news piece in an old newspaper when she was 19. She says she started thinking about this news piece after 20 years later that was covering a herbalist who lived in the 1930s Ireland. These details stuck in my mind. After months later I finally bought a Kindle version of the book and started reading. I should say it got me from the first sentence. Although it has a literature taste that makes it a bit complicated for me to understand the idioms sometimes, still I can recommend it whole heartedly. The purpose of research is to bring the book to life, not to weight it down. A novel should feel immediate, even if it’s set in the past.